Grant may be known as the "Old School Pack Buster," but what he sent me was FAR from Old School!! Yeah, you see that correctly! 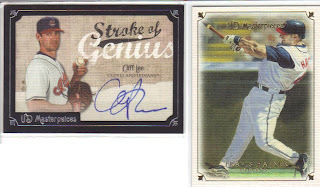 That's a Cliff Lee AUTO'D Masterpieces card! That is way too cool! He also threw in a Pronk Masterpiece for good measure! And then, he included a couple of 2009 A&G Minis! 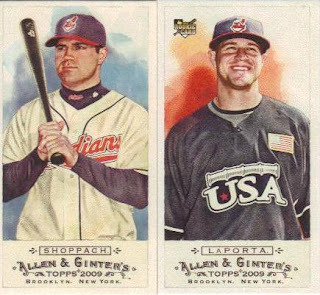 That's Kelly Shoppach and Matt LaPorta. Very nice in deed. 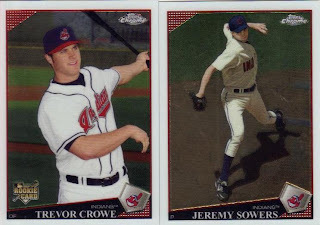 How about a couple 2009 Topps Chrome cards!? Jeremy Sowers and Trevor Crowe round out the gift pack. THANK YOU very much, Grant! The Lee card says it all: "Stroke of Genius!" Quick update to the Random Packs of Kindness team packs... They're done, finished, kaput. At least for now. SpastikMooss has laid claim what's left. I know, some of the team packs had more than one left, but I am saving any remaining team packs for another giveaway. Of course, randomly random is still open to anyone that wants some (even if you've asked before)! THANKS to EVERYONE that participated in the Random Team Packs giveaway! Don't worry, if you laid claim to some and haven't gotten them yet, yours will be coming soon! Nice!.....Very nice ! !.....Very,very nice !!!! when a Marlins pack of random cards happens can i be first on that list??? Thanks! haha I thought there was a Mets left. Guess not hahaha. WickedOrtega - I'll send ya some Marlins!